The Flavia de Luce series is a special favorite of mine. If you love cheeky british heroines and a good murder mystery, you don’t want to miss it. 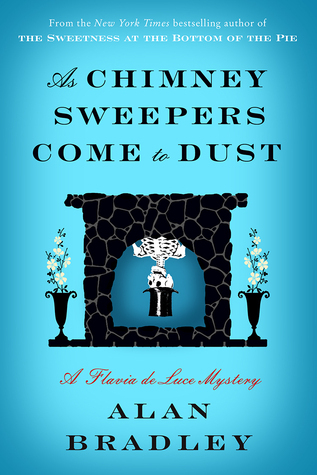 As Chimney Sweepers Come to Dust, by Alan Bradley, is the 6th novel in the series, which started with The Sweetness at the Bottom of the Pie. In the 6th installment, Flavia has been sent to some kind of mysterious finishing school in Canada, Miss Bodycote’s Female Academy, where her deceased mother Harriet went to school. The first night, unfortunately, a singed body falls out of the chimney like a blackened mummy, right onto the floor of her bedroom-and no one wants to talk about what might have befallen the poor victim-or who it might be. Something is very suspicious right away, her chaperones to the school are very strange and she can’t make heads or tails of the cryptic messages she keeps getting from her teachers and fellow students. Is there a conspiracy in effect? Who is in on the secret? Who can she trust? What will happen if she asks the wrong person the wrong question? Our cheeky little heroine isn’t one to shy away from a challenge, however…She’s determined to shake out the truth no matter what danger befalls her in the process. This series is a top recommendation from me to you…Don’t miss it! And if you do audiobooks, the audiobook for this series is perfectly narrated and very enjoyable. No excuses, start this series!